Including reading time in your daily routine not only boosts your kid’s language development, but it provides special one-on-one quality time that strengthens the bond between you two. Depending on your child’s age, you can focus on different aspects of the reading experience to get the most out of it. The American Academy of Pediatrics has created a literacy toolkit that includes great tips for parents and caregivers who wish to make the most out of reading time! This article will summarize a few key points about reading with a 2-year-old throughout two stages: 24-29 months and 30-35 months. Within each age range, you’ll find examples of what your child can do and what you can do to maximize the reading experience! Your child can: At this age, your little one can choose a book to read together –it might be the same one over and over again! She’ll probably be able to repeat a few words and phrases you say while reading, and love to laugh at silly stories and pictures. Your child might be curious and ask simple questions about the book, like “What’s that?”. You can: Find a quiet, cozy place to cuddle up and read together. This is a great way to calm and comfort your little one. While reading, pay attention to her cues and respond with excitement. If she says an important word like “dog”, you can say “Yes, that’s a dog! The dog is playing outside”. Read joyfully, using different tones of voice for each character. You can even count the objects in the pictures, and wait for your little one to repeat after you. 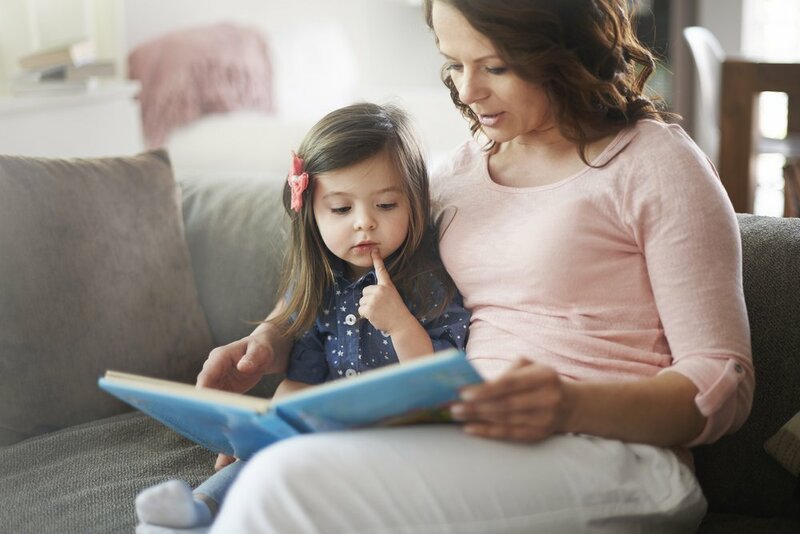 Your child can: At this stage, your little one can tell you the name of the story that she wants to read and even remember the one you read last night. You might notice that she tells you about the pictures in the story and uses longer sentences. She might have a favorite book, and be able to tell you her version of the plot. She’ll ask you specific questions about the characters in the story, and even incorporate those characters during playtime. You can: Find a quiet, cozy place to cuddle up and read together. When you are done reading, talk to your daughter about how the things that happen in the story are similar to the things that happen in her life. You can also discuss the characters’ feelings –has your little one ever felt that way? Read joyfully, using different tones of voice for each character. You can even count the objects in a picture or find the ones that are alike in some way. For example, look for everything that’s red. The science behind baby-talk: more than a guilty pleasure!